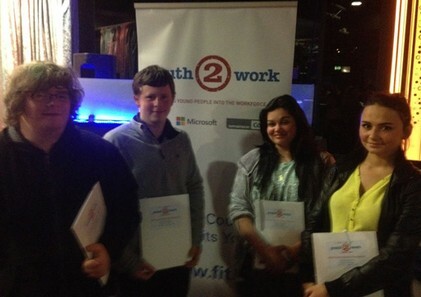 A group of students attended the Youth2Work Expo in the Riverfront Hotel, Virginia on the 18th April. The event was organised by FIT (Fastrack to IT) in conjunction with CMETB and provided career advice on the range of jobs currently available to young people. Information was given about training programmes that CMETB provide locally, which will help young people to access these jobs. The Youth2Work initiative in partnership with FIT, Microsoft and the GAA want to help drive local awareness of the emerging job opportunities in IT and related sectors in the greater Cavan and Monaghan region. Guest speakers from organisations such as Microsoft and the GAA provided an insight into how IT is being used in different industries and businesses. Staff from FIT also gave some practical workshops in areas such as creating an effective CV, job interview techniques and creating a LinkedIn profile, which students found very useful. For further information please visit www.fit.ie. in Ireland for the future. To begin the ceremony learners read the 1916 proclamation and then read their own proclamation for 2016. The Irish flag was raised above the centre and the national anthem was played. The ceremony was attended by Senator Diarmuid Wilson and the recently re-elected T.D. Brendan Smith. 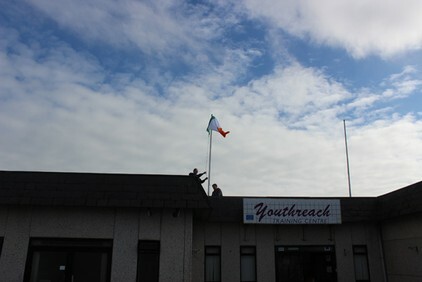 The Irish flag is raised above Cavan youthreach on proclamation day. 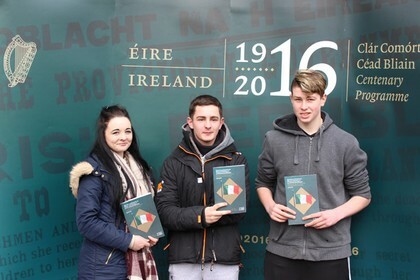 A group of leaners and staff from Cavan Youthreach attended a flag presentation ceremony in Croke Park on the 7 March in order to receive an Irish flag and a copy of the 1916 proclamation from the Thomas F. Maher foundation. President of Ireland, Michael D. Higgins as well many well-known Irish sports stars and celebrities were in attendance. The event included speeches, music and demonstrations by the Irish defence forces and was attended by thousands of young people from schools and centres across Ireland. The flag was brought back to the centre and will be raised on proclamation day, Tues 15 March. 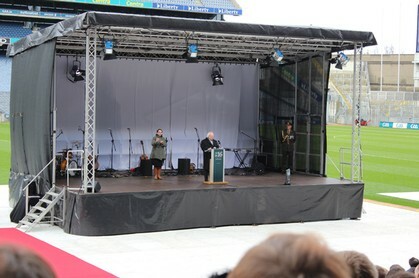 President Michael D. Higgins speaking at the flag ceremony in Croke Park. 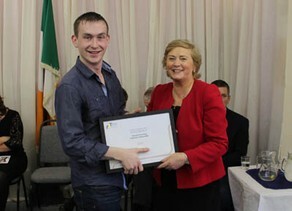 Cavan Youthreach learner Jamie shone a new light on the homelessness crisis at a ceremony in Dublin, where he was awarded first prize in the Irish Council for Civil Liberties (ICCL) Youthreach Human Rights Competition, for his uniquely creative lightbox installation entitled ‘Have you ever felt invisible before’. The installation – a mixed media piece combining Perspex, wood, photography and lighting - is “designed to encourage the public to consider the invisibility and anonymity of life on the streets for those experiencing homelessness”, explained Jamie. At the ceremony, held at the Ombudsman for Children’s Office in Dublin on Friday 12 December 2014, Jamie received his prize – a tablet computer courtesy of DID Electrical, as well as a work placement – from RTÉ’s Bláthnaid Treacy. ICCL Director Mr Mark Kelly said: “The entries to this year’s competition were of an outstanding quality, but Jamie’s remarkable work captured the imagination of the judges from the outset. It shines a light on the spectre of homelessness in a truly haunting way”. Cavan Youthreach learner Declan was also highly commended for his submission, a creative writing piece dealing with the theme of grief and loss. Both leaners put in an outstanding amount of hard work in preparation for the competition in order to develop their initial ideas through to completion. The ICCL/Youthreach Human Rights Competition, run jointly by the Irish Council for Civil Liberties (ICCL) and Youthreach since 2011, encourages young people in Youthreach centres across Ireland to apply their creative talents to explore human rights themes they are passionate about. 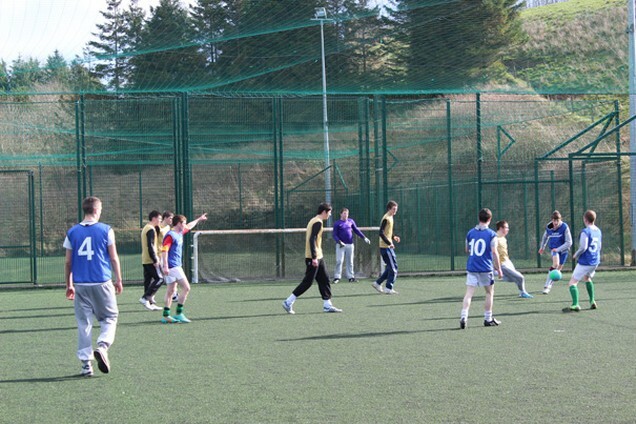 Congratulations to the Cavan Youthreach soccer team who secured a well-deserved 4-2 victory in a seven-a-side away match against Castleblaney Youthreach. After a disappointing start Cavan Youthreach were trailing 2-1 at the half time whistle. The team appeared a much more cohesive unit in the second half and dominated the match, due in part to an injection of energy from the substitutes' bench. Eventually their superior fitness and skill got the better of the tiring Castleblaney team, leading to three superb goals in the second half. 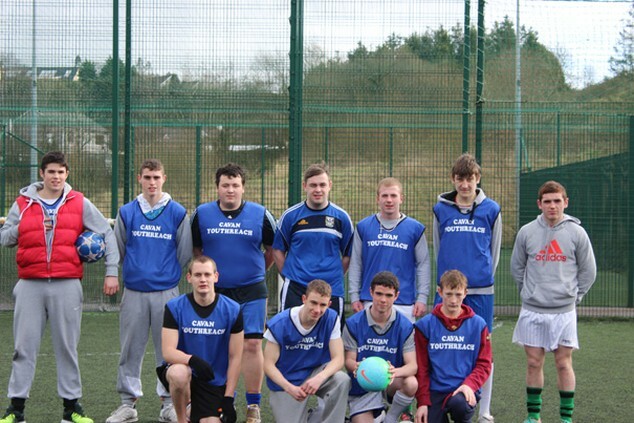 Cavan Youthreach maintained pressure on thier opponents throughout the second half to secure the 4-2 win. 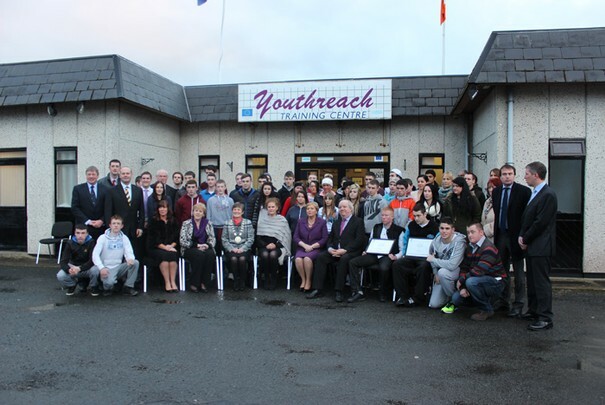 Congratulations to all 39 learners who were awarded certificates at 'The Presentation of FETAC Certificates 2014' which took place in Cavan Youthreach on Thursday 16th January. Minister for Children and Youth Affairs, Ms Francis Fitzgerald T.D. was in attendance and presented learners with both Component and full General Learning Certificates at levels 2, 3 and 4. A total of 28 Component Certificates and 11 General Learning Certificates were awarded on the day. The level of work was magnificent this year and a great tribute to the learners themselves and the dedication of the staff at Cavan Youthreach. Cavan Youthreach would like to thank all the leaners for their hard work throughout the year and congratulate them on their achievements. We wish them every success in their future endeavours. 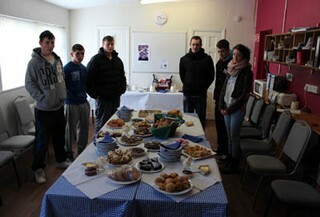 On Fri. 15th March learners and staff of Cavan Youthreach hosted a Fairtrade Coffee morning in the centre. 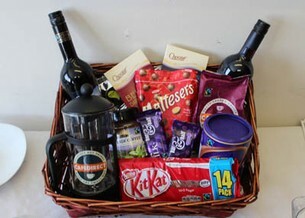 The event was organised to highlight the centre's commitment to purchasing and consuming Fairtrade products. 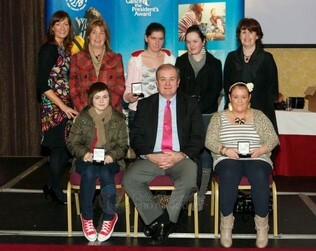 The 'Presentaion of FETAC Certificates 2013' took place in Cavan Youthreach on 28th Feburary. 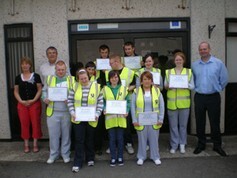 learners with both component and full Gereral Learning Certificates at level 2, 3 and 4. A total of 77 certificates were awarded. 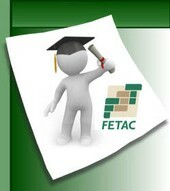 Congratulations to all our learners who were successful in submitting FETAC portfolios this term. All the hard work has certainly paid off with a total of 77 portfolios achieving awards. Three learners have been awarded full Level 4 National Certificates in General Vocational Studies and two learners have been awarded full Level 3 National Certificates in General Learning. Well done to all involved! 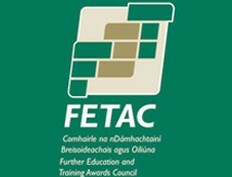 For more information on FETAC Awards at Cavan Youthreach click here. 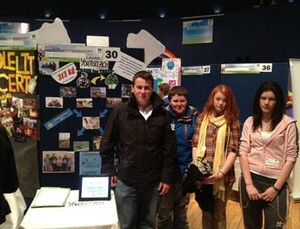 Students from Cavan Youthreach were selected to participate in the national 'Young Social Innovators' awards which took place in the Citywest Hotel on May 9th 2012. Under the guidance of Jason Smith, the team decided to raise awareness around the issue of binge drinking. The team chose this topic because they saw it as the number one issue affecting adolescents in Ireland today. Their project is an attempt to counteract the idea of binge drinking becoming socially acceptable. 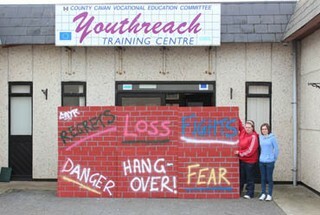 In addition to speaking on the topic, the team performed a visual arts display to maximise the impact of their message. Prior to the event, the team produced a DVD which encourages the audience to challenge previously held beliefs pertaining to alcohol consumption. The group intends to continue spreading the message and to expand the project to include workshops on healthy living and alternative activities to drinking. The Cavan Youthreach YEA project "Trash for Trees" was successful in reaching the finals of this year's Young Environmentalist Awards which was held in the Mansion House, Dublin on May 8th. The project was selected earlier in the year at a regional Eco-Den which took place at the Lough Neagh Discovery Centre on Oxford Island, Co. Armagh in March. On the day, the team showcased and discussed their business with peers and visitors and they had the opportunity to pitch their idea to a panel of expert judges. The team have arranged a collection point for unwanted items which are then sold on to a suitable recycling company. All funds raised are invested into planting trees and other environmental projects around the centre. Recycling has become an integral part of life at Cavan Youthreach and the team plan to continue and expand their enterprise over the coming year. 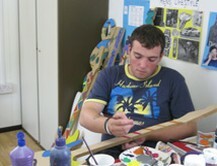 For more information on the project and to see how you can help please click here. Memebers of the project team were also delighted to be awarded an ECO-UNESCO 'Seed Grant' of €850 at the Young Environmentalist Awards. The grant money is being used to develop an allotment to grow potatoes and vegetables to supply the centre's kitchen. For more information on ECO-UNESCO and the Young Environmentalist Awards please click here. 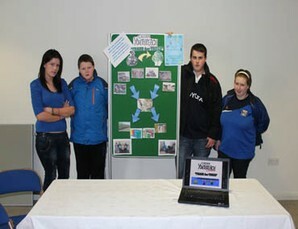 In May students at Cavan Youthreach completed a workshop with the Marie Keating Foundation, through its mobile information unit. The focus of the workshop was to educate, show and highlight the importance of early detection and self-awareness of cancer. Students received information on each of different types of cancers, they were provided with useful information designed to make people aware of the importance of good health with the emphasis on prevention and early detection. to visit the Marie Keating Foundation website. 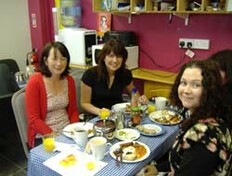 Well done to all who participated in our Cheerio's charity breakfast in aid of Childline on Friday October 7th 2011. Together we managed to raise a very successful €735.50, the most we have ever managed to raise for this cause. 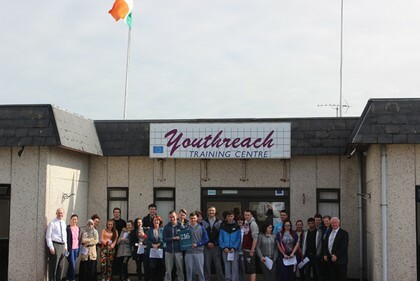 The Youthreach centre opened its doors to the public, who were treated to a full Irish breakfast and asked to make a donation. All of the cooking and serving was completed by our learners who received great praise on the day. Thank you to all who made donations. 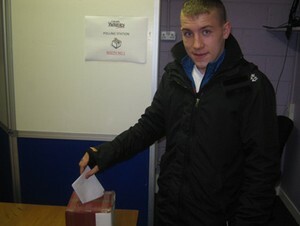 Youthreach’s very first student council has been elected! The council consists of 6 learners, 3 males and 3 females. 40 student votes were cast on 30/9/2011 and the winners were announced later that evening. Most of the learners had never voted before and the experience provided good practise for the presidential election. As part of the Green Schools Art Project Youthreach's learners have completed a sculpture under the instruction of artist Ross Cochlan. This project has taken place as part of European Week for Waste Reduction (19th-27th Nov.). 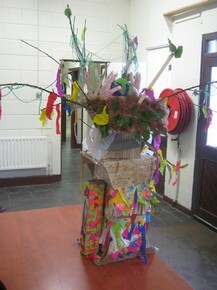 The sculpture was made from 100% recycled materials and was displayed in Crannóg Bookshop in Cavan town throughout the week. 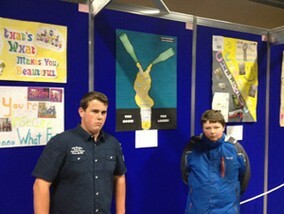 Congratulations to our learners who took place in the Young People & Alcohol poster competition. This competition was run in conjunction with the Outcomes for Children project and C.A.W.T. (Cooperation and Working Together). The successful posters from this region will be chosen and integrated into a 2012 calendar. 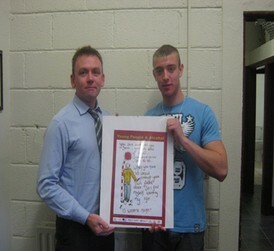 Dessie, who was the winner of the Cavan Youthreach section of the competition, received a framed copy of his poster along with a €50 voucher for Xtra-vision. in Croke Park on Sunday. 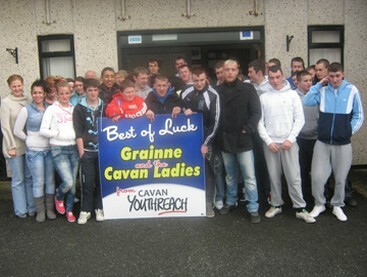 All the learners and staff of Cavan Youthreach wish her and the team the very best. 2010. 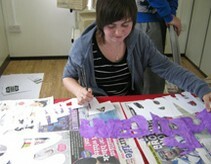 The girls worked hard to achieve the awards and developed many new skills. The girls also participated in many activities including a two day hike accross the bogs of Monaghan. Over the last number of weeks four learners from Cavan Youthreach have been attending a cross-border 18 -25 Peer Leadership Programme, which has been funded by the International Fund for Ireland. The programme involves young people from both the North and South of Ireland and takes place two days a week, one day in Blacklion, Co. Cavan, and the other in Cragavion, Co. Armagh. The programme, which runs until next summer, provides young people a chance to gain an ASDAN Certificate in Peer Leadership. It is hoped that the new skills learned will help the young people to become involved in youth work and peer leadership within their own communities. Once again Cavan Youthreach will be taking part in the annual Christmas Shoebox Appeal. This appeal is run by Team Hope, an Irish charity, who deliver shoeboxes filled with small gifts to disadvantaged children in Eastern Europe and Africa. 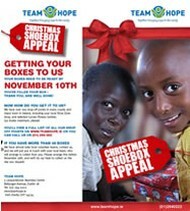 In the run up to the appeal deadline on 10th November learners will be filling as many shoeboxes as they can for donation to Team Hope. If you would like to get involved in the appeal by filling a shoebox or providing some small gifts please contact the centre. to increase awareness of environmental issues and promote positive environmental action. 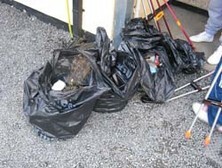 Litter collected from the centre grounds during 'Green Schools' clean-up. and staff worked together to cook and serve the breakfast which turned out to be a great success. A grand total of €601 was raised for Childline, over €150 more than was raised last year. to donating to a worthy cause. Learners and staff preparing breakfast and vistors enjoying their breakfast. 'Banish Your Demons' event, symbolising the 'burning away' of negativity and fears. opportunity to showcase their talents and to create an awareness of the 'demons' affecting young people. 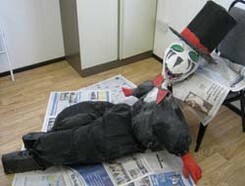 include a Halloween party, fancy dress, fireworks display, bonfire and the burning of the 'Demons'. 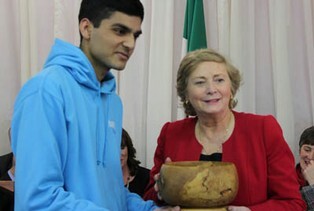 The Cavan Youthreach two-faced Demon. A group of learners from Cavan Youthreach have been working hard preparing an art project which will be displayed in Dunnes Stores window on Main Street, Cavan during the upcoming Fleadh Ceoil this August. The project involves larger than life musical notes and instruments which will be suspended together with cuboids covered in the sheet music of traditional Irish songs and ballads. This project is being run in conjunction with Cavan County Council and the learners from Cavan Youthreach are delighted to be involved. Many of the learners are extremly artistic and creative and a project like this provides an ideal oppourtunity to showcase their talents. 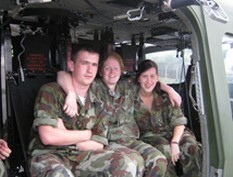 Dun Ui Neill Barracks, Cavan were treated to a very special helicopter display. 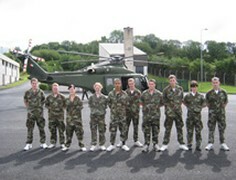 The helicopter which is based in Baldonnell was on border patrol and flew into Cavan especially for the learners who got the chance to experience what it might be like to be a member of the helicopter crew. Learners who have worked hard during the year to complete modules at both FETAC Level 3 and 4 have been issued with their results. 108 modules were submitted for Level 3 and 58 for Level 4. All these modules recieved either a pass or distinction. Congratulations to all the learners who achieved FETAC modules in the wide range of subjects on offer at Cavan Youthreach. 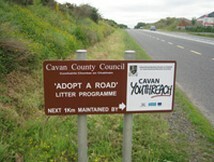 Cavan Youthreach in conjunction with Cavan County Council has officially adopted a 1KM section of the Cavan bypass. Learners and staff are required to perform regular litter picks along the stretch of road. A group of learners from Cavan Youthreach have been rewarded for their hard work by winning second prize and €500 in the Cavan County Council Spring clean competition. 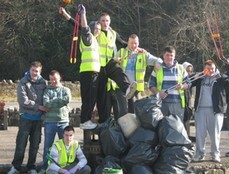 In early March a group of learners and staff armed with litter pickers and black bin bags made thier way to West Cavan. Many people are unaware of the scale of the litter problem in rural Cavan. It's a shame to see litter at the beautiful locations we visited such as Brackley Lake and Tullydermott Falls. A group of learners represented Cavan Youthreach in the national finals of the Young Social Innovators (YSI) competition which was held in Croke Park on the 5th May. 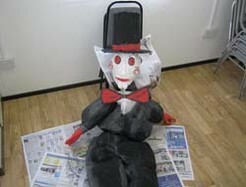 The learners had prepared a short sketch highlighting the impact of littering.